“My way of investing is not for everyone,” says Peter Pandolfo as he shared stories of his career path and what led him to owning his successful, privately owned investment advisory firm, Pandolfo Capital LLC. Pandolfo’s investment approach concentrates on a relatively limited number of investments in which he has detailed knowledge, rather than investing in a large number of investments about which he has less information. 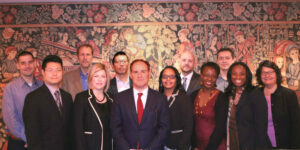 At the Rutgers University School of Business–Camden’s Executive Lunch Series on Nov. 3, Pandolfo SBC’92 held a nearly two-hour-long discussion with 10 students, along with Andrei Nikiforov, an assistant professor of finance, and Ivo Jansen, an associate professor of accounting. 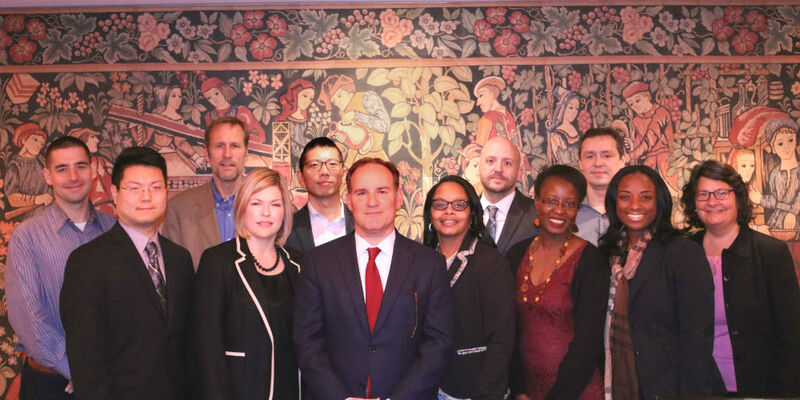 The event, held each semester, provides students in Rutgers–Camden’s master of business administration programs an opportunity to meet with local executives to learn what it takes to succeed in business. 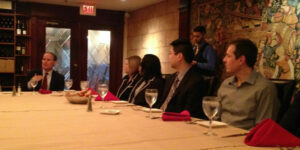 This luncheon was held at Caffe Aldo Lamberti in Cherry Hill. Growing up in Lindenwold, Pandolfo was the middle child of five siblings. “My family didn’t come from a lot of means,” he told the group. After graduating from Rutgers–Camden, he worked at Merrill Lynch for 16 years, until 2008, when he founded his Princeton-based company, which manages private accounts. The company has managed approximately $17 million in private accounts. Pandolfo says Clifford Brown, a former Rutgers–Camden philosophy professor, had the greatest influence on him during his time as a student. Through his philosophy classes, Pandolfo developed analytical skills. Pandolfo, a member of the Dean’s Leadership Council at the Rutgers School of Business–Camden, was thrilled to have the opportunity to meet with students. “There were people in my career who were very helpful to me, who shared their experience with me, so in any way that I can help, I’m happy to do it,” says Pandolfo.